The Borneo honour was awarded for the Regiment taking part in a campaign; and was nominally awarded to all units who took part. On 1 May 1945, the 9th Division's 26th Brigade landed at Tarakan Island to establish air and naval facilities to support forthcoming Australian operations in Borneo and to conserve oil installations. The Australians encountered stiff resistance from Japanese in strongly entrenched bunkers and tunnels but organised resistance ended on 15 June. 1,600 Japanese were killed on Tarakan and 314 were taken prisoner. Australians killed totalled 233, wounded 644, while 1,434 were evacuated through sickness. The 9th Division landed in North Borneo and Labuan island on 10 June 1945. Brunei was captured on 13 June and Limbang on 18 June. After further landings Beaufort was captured on 28 June. The 7th Division landed in Eastern Borneo on 1 July and captured the port and oilfields of Balikpapan the following day. Heavy fighting continued for the next two weeks as Australians pushed up the Milford highway and overcame Japanese resistance at Batuchampar. After the Japanese withdrew into the hills the Australians conducted deep patrolling where some clashes occurred. The Japanese suffered over 2,000 casualties while 229 Australians were killed and 634 wounded in what was the last invasion of the 1939-1945 War. The 1st Armoured Regiment (Royal New South Wales Lancers) was part of the landing at Balikpapan and the subsequent advances inland. 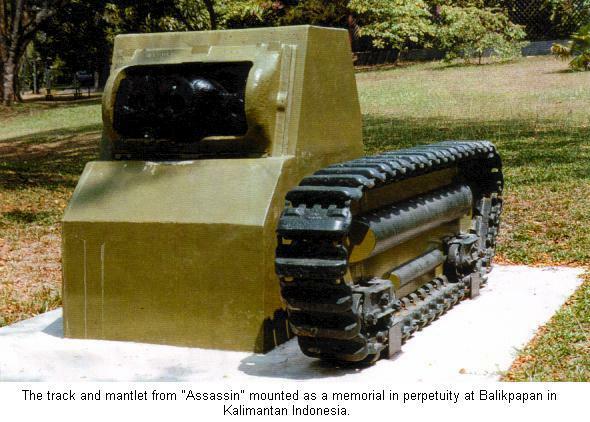 Individual battle honours Balikpapan and Milford Highway were awarded to the Regiment under the auspices of this campaign. 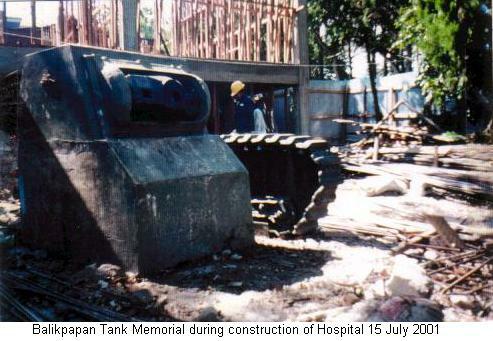 The park above was re developed as a hospital, with the memorial in quite a mess during the construction stage. 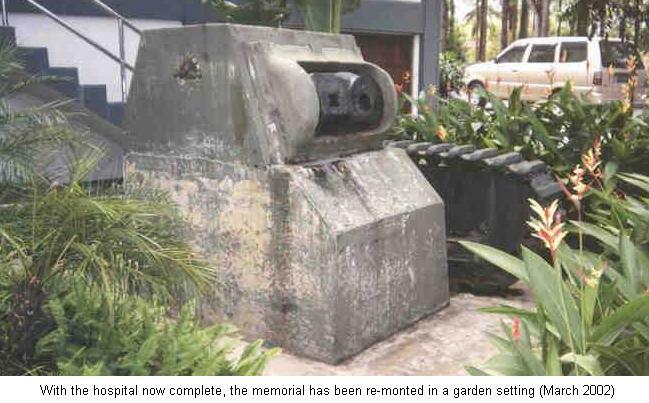 Now that the hospital is complete, the memorial has been re-mounted in a garden setting as can be seen below. Photographs from The Jack Ford Album, Courtesy the late Colonel Gordon Glasgow OBE ED, Coates Hire and Bryson Keenan Assistant Army Attach�, Australian Embassy - Jakarta (2002).